My husband and I spent our honeymoon in Spain, it was beautiful every single day. We ate lots of fresh fish, salad, spaghetti and olive oil (and churros – wow!). The food was always amazing, fresh and exciting. During our newlywed days we often tried to recreate the meals that we ate in Spain and this was one of our creations. It was an instant hit and we have been making it and recreating it ever since – see Clean Eating Mackerel Asparagus Spaghetti. 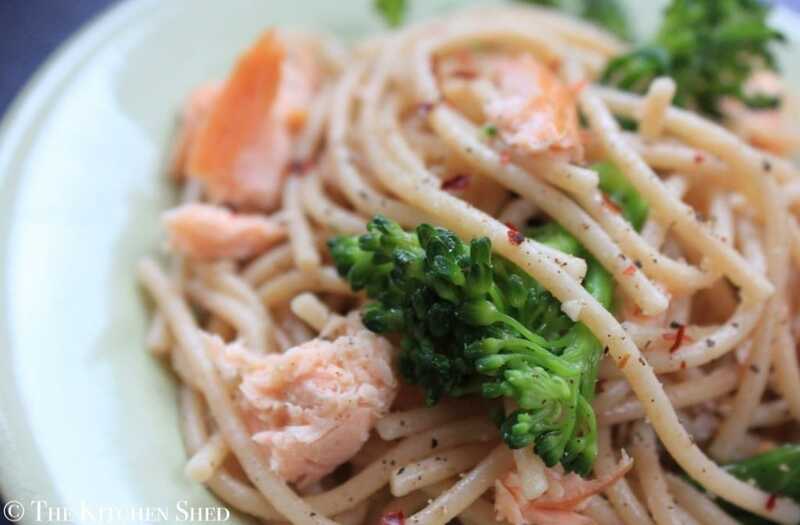 Clean Eating Salmon Broccoli Spaghetti is my favourite go to quick meal. Its easy to put together and we all love it. It is a great source of Omega 3, Vitamin C and Iron. You can add chilli flakes or drizzle some freshly squeezed lemon juice over it to make it extra delicious! Serve with a side salad and save any leftovers, it tastes great the next day! 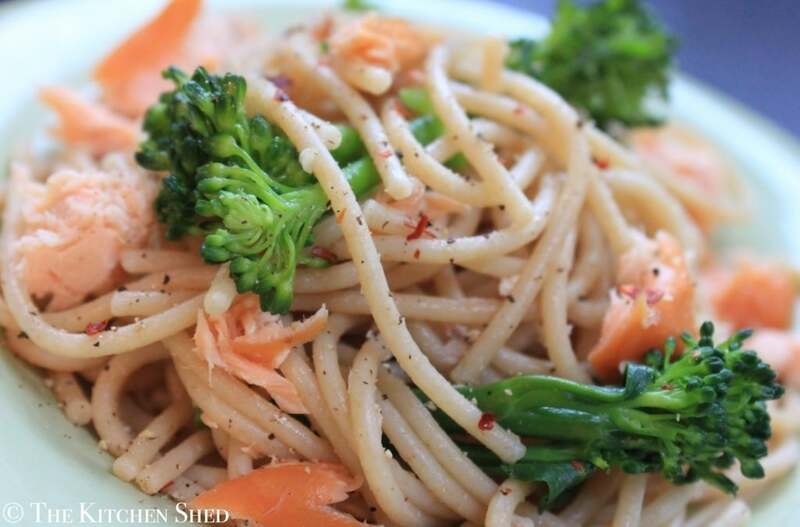 Clean Eating Salmon Broccoli Spaghetti is my favourite go to quick meal. Its easy to put together and we all love it. You can add chilli flakes or drizzle some freshly squeezed lemon juice over it to make it extra delicious! Cook the spaghetti in a large pan of boiling water for approximately 11 minutes. In the last 4 minutes of cooking, add the broccoli (top up with extra boiling water if needed). Once cooked, drain the spaghetti and broccoli and drizzle over the olive oil and toss to coat the spaghetti. Allow the spaghetti and broccoli to cool in the colander for about 20 minutes, tossing with two forks every now and then to release the hot steam. Whilst cooling, flake up the salmon into even pieces and set aside. 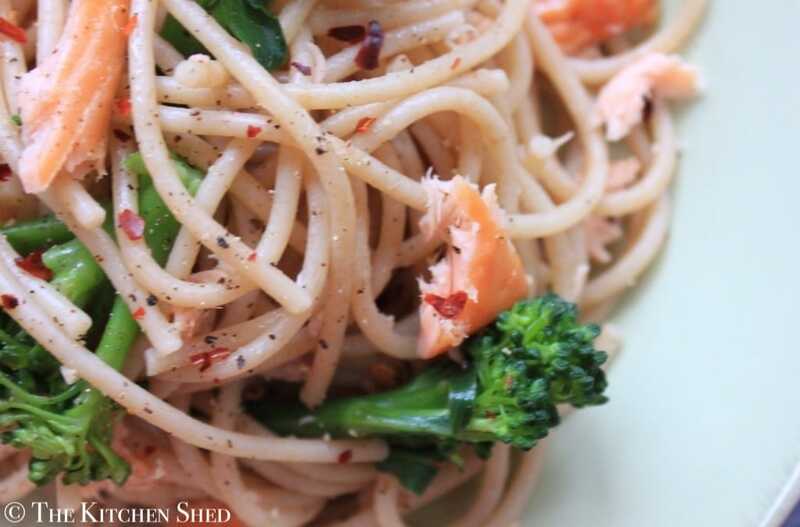 Once the spaghetti has cooled to room temperature, add the flaked salmon and toss to combine. Add sea salt, black pepper, chilli flakes or lemon to taste if desired. Serve with a side salad.